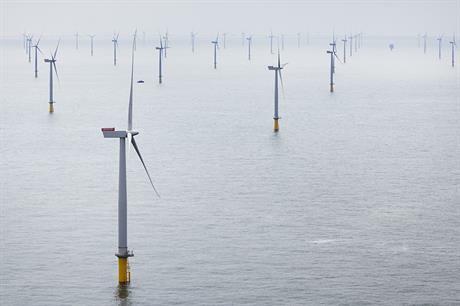 UK: Offshore wind could be subsidy free by the mid-2020s if there is a "sufficient scale of market", a report by the government's advisory board, the Committee on Climate Change, said. The "Power sector scenarios for the fifth carbon budget" report by the committee is designed to help the government meet carbon reduction targets. It found that from 2020, onshore wind could be considered subsidy free and offshore wind would reach that target in the decade after if enough capacity guarantees are given by the government. "A sufficient scale of market, signalled in advance, is required to drive private sector investment in innovation (eg, to create bigger turbines), to support a competitive project pipeline and supply chain, and to encourage a falling cost of capital through mature financial sector involvement," the report said. It also said much of the spending to bring down offshore costs has already been spent or allocated. "We estimate that the annual cost of supporting new offshore wind from 2020 to 2025 is a further £0.9 billion (on top of the £3 billion already committed to 2020). This would support a programme of 1-2GW per annum in the UK to 2025, after which offshore wind should be able to compete free from further subsidy," the report said. The report found there was also some scope for onshore costs to fall. "Onshore wind costs in Germany and the US are £50-70/MWh and £30-50/MWh respectively, due to a combination of enhanced technology (eg, larger blades, taller turbines, which are currently restricted due to UK planning regulations) and lower cost of capital (eg, as low as 5% compared with an estimated 7.1% in the UK)." Current UK planning laws restrict turbine tip heights to 125 metres. This is preventing the deployment of larger rotor-diameter turbines, which would increase the amount of power generated and lower costs. The report recommends keeping less established technologies like offshore wind separate from the more established ones in any future Contracts for Difference subsidy auctions. This would be to allow offshore wind the chance to continue deployment without having to compete with lower cost renewables. Finally, the report recommended setting the auction reserve prices for onshore wind at £80/MWh, so they are equal to the lifetime cost of new gas capacity, effectively forming a subsidy-free CfD.